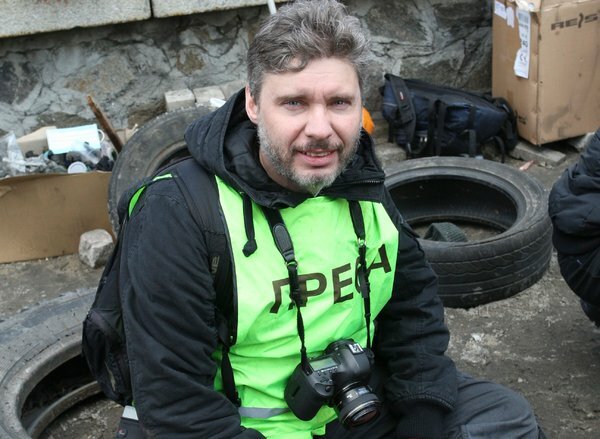 The Russian photojournalist Andrei Stenin, who went missing while embedded with separatist rebels in eastern Ukraine last month, was killed in an attack on a convoy four weeks ago, Russia’s state news agency reported on Wednesday. His remains were apparently discovered by Aug. 21 near the rebel-held city of Donetsk, after the insurgents had pushed back government forces from an area near the site of the downed Malaysian Airlines Flight 17, separatists told the Organization for Security and Cooperation in Europe. Video first posted online on Aug. 22 by the Russian news site Komsomolskaya Pravda showed a burnt-out car and camera equipment found at the scene and investigators removing a body as an OSCE monitor looked on. Given that the attack seems to have taken place about two weeks before rebels regained control of the area and discovered the reporter’s body, and Ukrainian officials are now unable to access the site, the circumstances in which Mr. Stenin died might never be completely known. Russian investigators, however, insisted that the photographer was traveling in “a convoy of at least 10 vehicles carrying civilians,” Mr. Stenin’s news agency reported. Video posted on YouTube a week after the attack appeared to show rebels in the same location inspecting a line of destroyed cars. Bloggers on the Ukrainian side noted, however, that video recorded by the same rebels also clearly showed the separatist fighters traveling, as they often do, in civilian cars. Natalia Antonova, a journalist and playwright in Moscow, pointed out on Twitter that Mr. Stenin’s fate had already become part of the information war between Russians and Ukrainians. On the Russian side, Stenin's dead body now clearly another prop in a ghastly political spectacle. My sympathy is to his family. Komsomolskaya Pravda had a video that showed journalists tampering with Stenin's alleged final resting place. We may never know the truth. Could have been the Ukrainian army that accidentally killed Stenin. Could have been separatists. No one wants objective info either way. Mr. Stenin had been working for the agency Rossiya Segodnya, or Russia Today. In a televised commentary on the journalist’s death, the head of the agency, Dmitry Kiselev, spoke as if there was no doubt about what had happened, blaming Ukraine’s military for the attack. Dmitry Kiselev, the head of the Rossiya Segodnya International Information Agency, announced the death of Andrei Stenin in video posted on Facebook Wednesday. Speaking in English, Mr. Kiselev also denounced statements by a Ukrainian Interior Ministry official, Anton Gerashchenko — who was quoted as saying last month that Mr. Stenin had been captured and could face charges for taking part in “torture” by photographing wounded soldiers captured by the rebels. Those “lies,” Mr. Kiselev said, had given false hope to the journalist’s family and to colleagues who had mounted a social media campaign demanding his release. Mr. Kiselev is the fiery pundit handpicked by President Vladimir V. Putin late last year to lead Rossiya Segodnya, which is charged with explaining Kremlin policy to the world. Before that Kremlin-ordered reorganization of state media, Mr. Stenin had already shot for RIA Novosti, the more independent predecessor of the new agency.